Epiphone's number one selling model! The Les Paul Junior was first introduced by our legendary Kalamazoo factory in 1954 and was intended as an affordable way for beginners to get the look, sound, and feel of a real Les Paul. However, the Les Paul Junior quickly became a legend of its own. 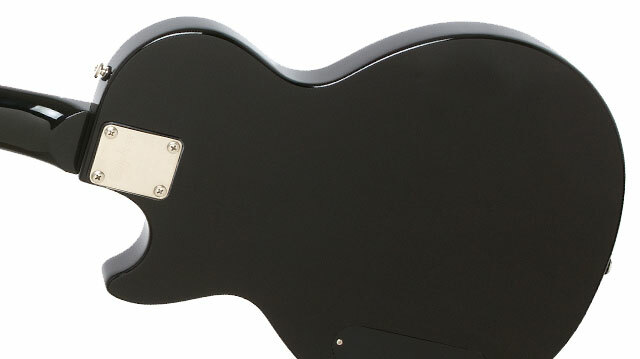 Throughout the years and in all its many incarnations, the Les Paul Junior has been an on-stage favorite for artists like Leslie West of Mountain, Keith Richards, Paul Westerberg of the Replacements, and John Lennon, who all embraced the Les Paul Junior for its lighter weight, commanding sound, and all-mahogany body. Today, the Epiphone Les Paul Junior is still the best way for beginners to get started on a full-size guitar with real vintage Les Paul tone. And if the Les Paul Junior’s rock and roll history wasn’t enough to convince you, check out Rocksmith™, the breakthrough guitar video game which features the Epiphone Les Paul Junior as its go-to guitar! The Les Paul Junior’s legendary rock and roll tone comes from an all-mahogany body tooled to the trademark Les Paul shape. And just like vintage models, the Epiphone Les Paul Junior features an all-mahogany neck with a 1960’s SlimTaper™ profile. The neck is bolted-on for a long-lasting fit and features a rosewood fingerboard with a 12" radius with pearloid dot inlays and a classic-sized 1.68” nut. The Epiphone Les Paul Junior is available in Alpine White, Cherry, ebony, Heritage Cherry Sunburst, Translucent Blue, and Vintage Sunburst color finishes. The Les Paul Junior is voiced by a powerful, noise-free, open-coil Epiphone 700T humbucker pickup in the bridge position which gives the Les Paul Junior that big, unmistakable Les Paul sound that can go from subtle color shades to crunch at your command. There really isn’t any classic rock and roll sound you can’t get with an Epiphone 700T humbucker. Like all Epiphone electric instruments, the Les Paul Junior comes standard-equipped with long lasting and low noise 500K ? 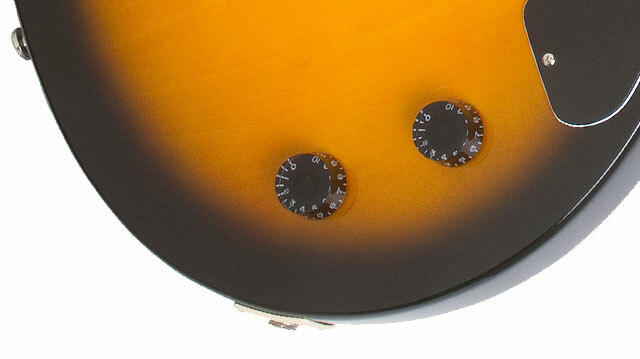 sealed potentiometers for the Master Volume and Master Tone controls which feature Black Speed™ knobs. The Epiphone Les Paul Junior features all-metal hardware that can last for the life of the guitar. Just like the Kalamazoo-made originals, our Epiphone Les Paul Junior features a combination wrap-around StopBar™ bridge and tailpiece with compensated saddles and adjustment screws to allow for accurate intonation. 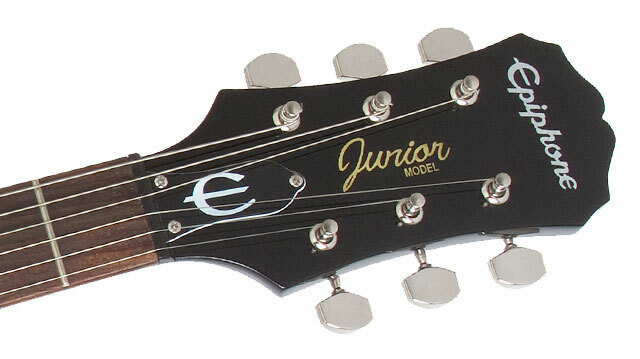 And, the Les Paul Junior also comes with Epiphone’s heavy-duty non-rotating output jack for years of reliable performance.